Introducing Comparative Education aims to familiarize newcomers with comparative education as a field of study and to provide a continuing reference as people become more actively involved with comparative studies and the problems associated with developing them in rigorous and productive ways. The purposes and methods of comparative education are also discussed. Comprised of eight chapters, this book begins by presenting a neat, simple, and generally accepted definition of comparative education. 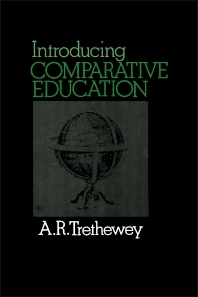 The reader is then introduced to the history and development of comparative education; the purposes of comparative education; some of the pitfalls in trying to compare education or educational systems across cultural and national boundaries; and some of the alternative methods open to those who would like to develop studies in comparative education. The approaches associated with Isaac Kandel, Nicholas Hans, and G. Z. F. Bereday, Brian Holmes, Edmund King, Harold Noah, and Max Eckstein are considered. The book concludes with a listing of resources for teaching and learning. This monograph is intended for students and educators.